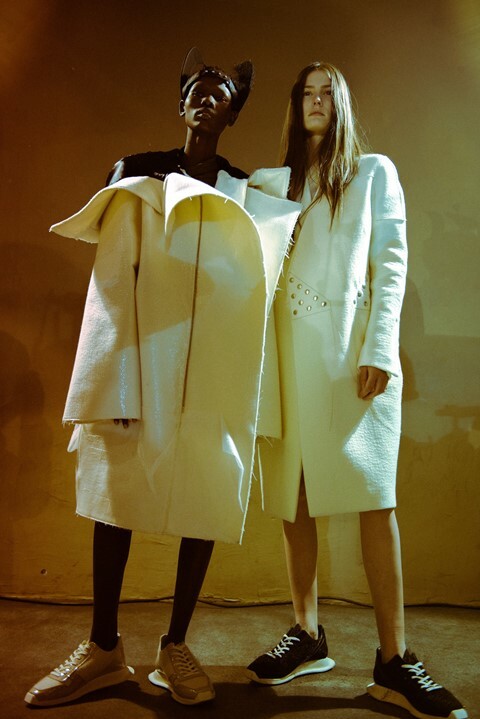 Day four at Paris Fashion Week and on the line-up today was Natacha Ramsay-Levi’s second instalment at Chloé, Ann Demuelemeester’s dark romanticism, absolute chaos at Off-White, and one of our favourites: Rick Owens. Here’s what went down. As (almost) always, the show took place in the halls of the Palais. Continuing his grand tour of every available space in the building and beyond (we’ve done the fountains, basement, the upper floor...), tonight’s presentation was in yet another of the venue’s vast spaces. ...quite a departure from the ‘terror techno’ of the menswear show. The music was a remix of 1950s show tune “Baubles, Bangles and Beads” – a yearning, wistful song about dressing, seduction, and expectations by Dietrich, Minelli, Peggy Lee, and Eydie Gormé. If Marlene were around today we could totally see her in some Rick Owens, so it made quite a fitting choice. Following on from last month’s men’s show, Owens’ AW18 womenswear collection is also entitled Sisyphus (after the arrogant Greek king who was punished by Zeus to forever roll a boulder up a hill, only to have it roll back down again – so far, so anxiety-inducing). While he explored ‘cultural backpedalling’ and the way society is seemingly regressing when it came to the boys, when he was creating the women’s offering he had seduction on his mind. The unique bulbous shapes seen over the course of the last few seasons were all back, only this time they were less about protection and this time more about voluptuousness – the show notes mentioned the ‘grotesque physical distortion in the name of seduction’ and referenced bustles and panniers which deliberately exaggerated the body’s attributes in times gone by. Tunics were packed with goose down to abstract the models’ silhouettes, while huge ‘megaparkas’ were thrown over cashmere shorts and mini dresses. Yes, you did read that correctly. Although there have been flashes of muted colours here and there throughout his collections for a couple of years now, AW18 offered the boldest hues seen from the designer perhaps...ever? Short dresses and duffle coats were rendered in golden yellow and brown gingham (Rick did a check! ), while jewel-like turquoise satin linings peeped out from garments. The collection felt optimistic: it seems the bad mood he was in last season has lifted.